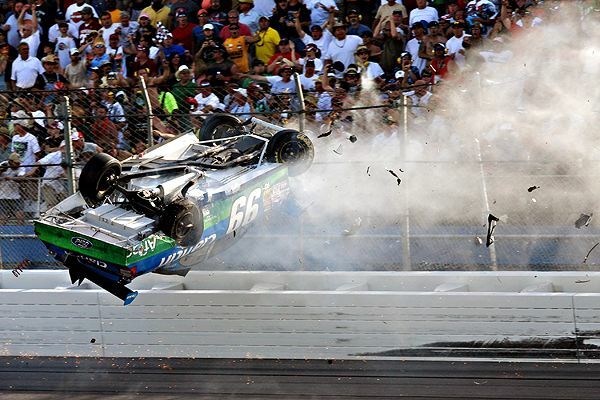 Yesterday's NASCAR race at Talladega ended in a spectacular crash on the last lap. Josh and I were watching the early parts of the race as his driver (Kyle Busch) and my driver (Denny Hamlin) took turns leading the race. We then took a trip to the mall for a Build-a-Bear excursion with the family and missed the end. I ended up taping it via the ol' Slingbox and watched the finish later last night. On the last lap, unknown driver Brad Keselowski accidentally flipped the #99 car of Carl Edwards only a few yards from the finish line. Edwards went airborne and slammed hard into the catch fence that NASCAR installs precisely for these types of situations. If you view the video below you can see the fence buckle and notice that a few pieces of "shrapnel" careen into the stands. Edwards got out of the car and was not hurt and even pulled a Ricky Bobby from Talledega Nights as he ran across the finish line (you have to be in your car to officially finish a race in NASCAR). Yesterday's crash really shows the dangerous and thrilling appeal of the sport. Memo to self: Don't buy tickets in the front few rows. Doe, Dre, Besse and I will be sitting Row 4 on the back stretch at Richmond on Saturday. However, they don't reach 180 mph and higher like they do at Talladega and Daytona.